Our view of Mt Shasta from just above Etna Summit. As we have been hiking the trail, I have noticed that it is a study of both constants and contrasts. One thing that we really enjoy is having visual topography as a constant reminder of where we have been, where we are and where we are going. Since the day before we arrived in Ashland, we have seen Mt. Shasta on the horizon at least some parts of every day. 8 days later, it's still there and getting much larger. We have seen the northern and western slopes and soon we will have the southern slope over our shoulders. We love this constant reminder of our progress and how it provides a sense of our general location. It was a surprise to hear from some NOBO hikers a lament about how long they had to see Mt. Shasta, nearly 3 weeks, and how it made them feel they were getting nowhere fast. We've discovered that many thru-hikers who know only the distance they have traveled and describe their campsites as "some place by a road (or stream, or lake, or forest)" with no interest in knowing their surroundings other than waypoints to pass on the way to their goal. There are a couple of common smartphone apps that most hikers use, and both measure things in miles and list only roads, trail junctions, water sources, and campsites. They don't list any other place names or landmarks, and hikers that don't use some type of map will never know what they are passing by and through. These hikers see leaving a prominent mountain behind as progress, and when it doesn't disappear quickly it is a disappointment. They may not even notice the different angles of the peak that have been presented by the circuitous route of the trail. We feel firmly grounded to the terrain through which we hike, love knowing place names, and prefer to have visual reference points to mark our days. Another constant, unfortunately, is fire. The day after we left Seiad Valley, the Gap fire started near that community. We could see the smoke plume intermittently through Day 54 while hiking and it was very prominent from the town of Etna. Each day since then we have seen reminders of the fire. At higher elevations we can see the plume rising in the distance and throughout the day we track the smoky haze that it leaves on the horizon. Unfortunately the fire has grown steadily, affecting a larger and larger area. Although we are moving away from the fire and our skies overhead have been clear each afternoon, the smoke has a way of reaching our location through the course of a day and our past few nights have been smoky. 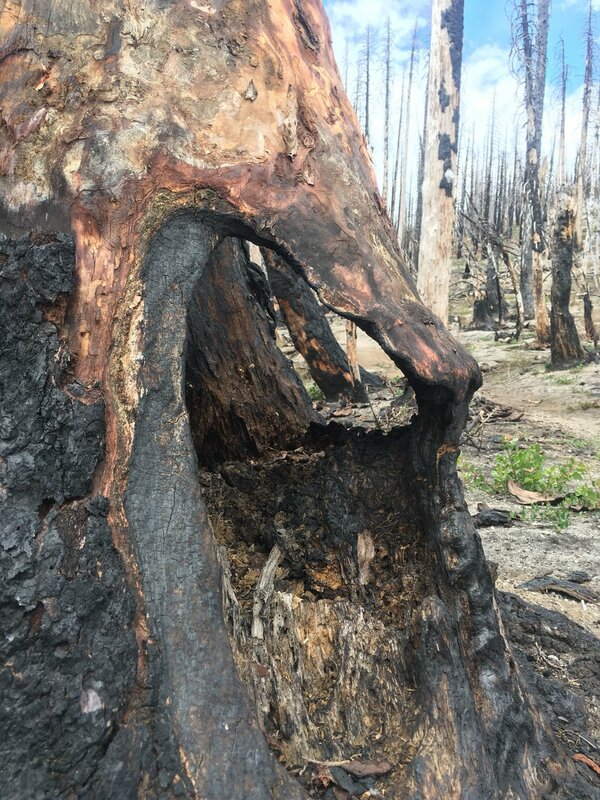 With the past 4-5 years of drought, bark beetle infestation, and other diseases all affecting forest health, there is a lot of fuel ready to burn. As of this writing, the Gap Fire has closed 30+ miles of the PCT north of Hwy 96, burned >17,000 acres and is only 10% contained. A third constant in this section of Northern California has been, for the most part, the trees. The most common species we've passed have been Douglas Fir, Western Hemlock and Jeffrey Pines. In the more open areas and at lower elevations the primary understory plant has been manzanita. It has been comforting to see trees that we recognize and to continue to see them through the different mountain ranges that we have crossed. Constant Mt Shasta, contrast an Alpine Lake to explore another time. There have also been contrasts. We left the road at Etna Summit and soon entered into stunning granite peaks whose crags cradled pristine lakes. We traversed through miles of this splendid alpine landscape, then crossed over a pass to find an instant change in terrain. 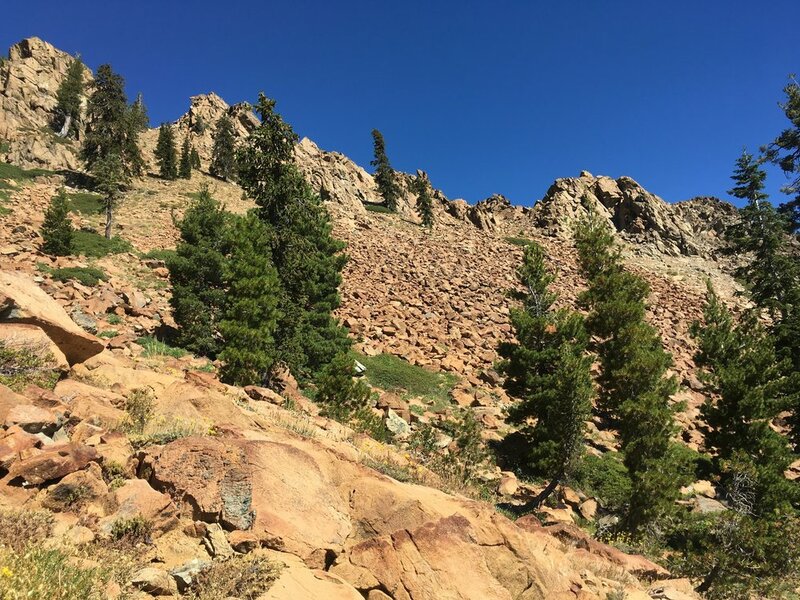 On one side was a wide open cirque with steep granite sides dotted with small stands of trees and punctuated by an occasional spring or stream running down into the valley below. 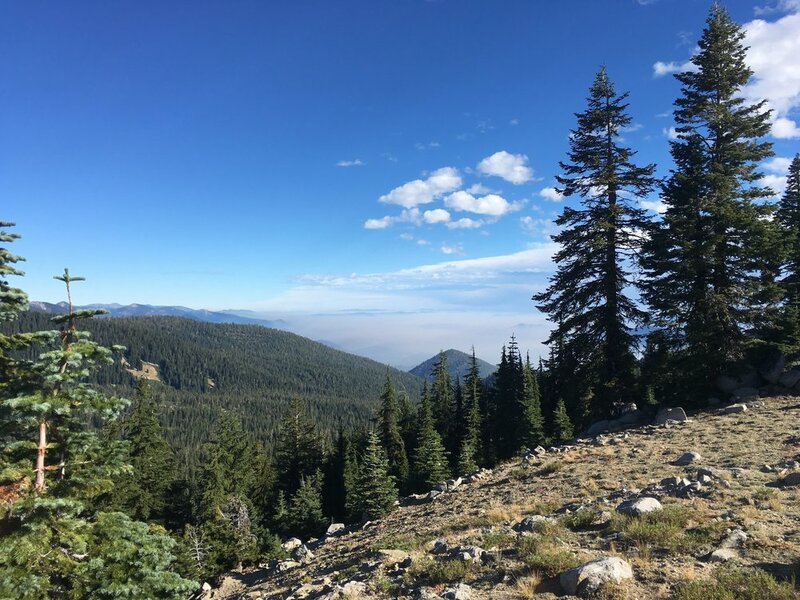 On the other side we found dense forest of mature trees at the ridgeline, then dropped down onto a dry dusty meadow of late summer grasses and wildflowers. Erosion channels forming between the trees and little new growth. New growth on the slope and the unintended artistry of fire on this tree. We have also seen the effect of fire throughout these mountains. Even within the same range we saw two very different appearing burn zones. In the first area, everything had burned to the ground which was a mix of sandy dirt and decomposed granite. There were large erosion channels between the trees giving the landscape a washboard appearance and on is exposed slope it seemed as though all if the earth might wash away after one good winter. Very little regrowth was present and consisted of a few scattered wildflowers (mainly fireweed). On the very next slope, the terrain consisted of large granite rocks nearly covering the surface of the ground and while the devastation of trees was similar, there was no visible evidence of erosion and the forest floor was filled with far healthier regrowth of smaller plants and even some young trees. Across the valley, we could see that the fire had left islands of trees intact on the opposing slope. These should make regrowth that much easier as there will be a ready source of plant life to spread outwards across the burn zone. Over the past 8 weeks on the trail, we have seen many areas of previous forest fires and no two have been exactly alike. Smith Lake in a granite basin our introduction to the Russian Wilderness. More views from the Russian Wilderness. Majestic clouds, granite crags and slopes sorts with trees. We love it out here! Day 56 took us across the Russian Wilderness with its beautiful white granite mountains. That evening we crossed Hwy 93 and entered the Trinity Alps Wilderness. We camped near Scott River nestled in the bottom of a valley and the next morning had a steady climb to be back in the high country. Over the past few days we had seen snowfields on distant peaks in the Trinities that we're getting closer, and we hoped that we might be visiting them or passing nearby. Alas, they were still several ridges distant as we crossed our high saddle and turned away. Instead, we had forested slopes and a few patches of deep red rock and earth. Given the heat that we had been experiencing for the past few weeks, we were thankful for these forested slopes and made good progress through along the trails cushioned with pine and fir needles and sheltered by the branches above. Blue skies and red rock. The red mountainous slopes of the Trinities. So different from the day before. Soon we left these forested slopes for good and the ground beneath our feet changed to red chalky dirt. As we left the dense forest behind, it felt like we had walked onto a red planet. The slopes were littered with broad talus fields of deep red rock, and the ridges above were composed of intricate red features. 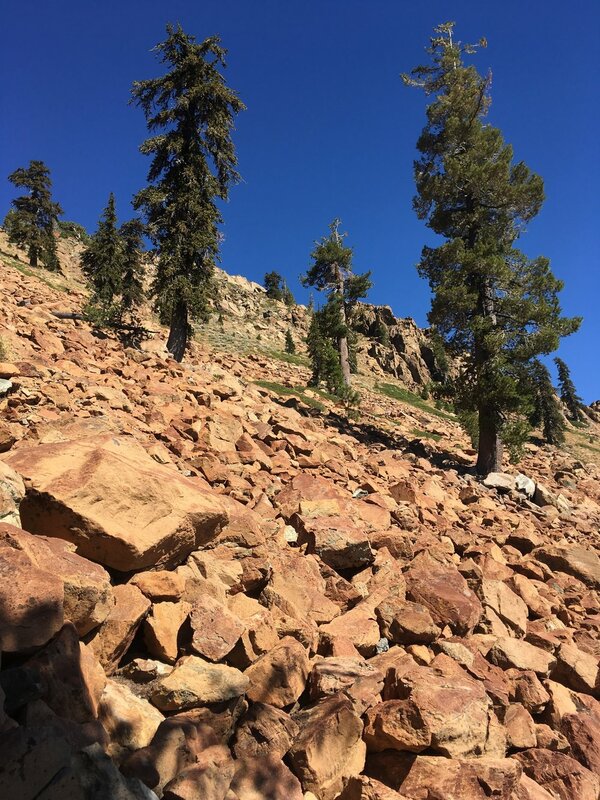 We were surprised to find a large stand of Foxtail Pine thriving on these stark rocky slopes as we didn't realize this high-elevation favorite of ours was found outside the Sierra. With the rock, the trees, and the sky we were in a red heaven and savored the landscape over a lunch break at a point that gave us a panoramic view. It was such a contrast to the also-beautiful pure white granite of the previous day. Welcome clouds and a brief burst of hail and light drizzle. The same day, fewer clouds yet the blast furnace was only set to "mostly hot" vs "high broil." The final contrast has been the weather. For the past 3 weeks, we have had bluebird skies accompanied by blast furnace heat during much of the day. When we awoke in Etna, there were high clouds that persisted for most of the morning, and it was only 60 degrees when we hit the trail relatively late at 9am. We were thankful for the clouds and the moderating effect they had on the temperature. That evening the wind and clouds both picked up and we even contemplated using our rain fly. By the time we set up the tent, the clouds had dissipated and there were just enough to give us some sunset colors. The next morning, I awoke to clear skies while I organized brekkie but the early morning stars were soon obscured. Clouds continued to build and we had a few brief periods of rain and even hail a few miles into our hike. By mid-afternoon the sky was clear and it was relatively hot in the direct sun. But since then we have seen the heat turned down a notch or two and for that we are quite thankful. Wild Mountain Sula circa 2008. Sula in her meadow on our last camping trip with her. Waiting for some pizza, no doubt. There was one more very important part of our day in the Trinity Alps. As many of you know, our Great Dane Sula was a huge part of our lives for the past 12 years. She was a constant companion at home and joined us on many camping and backpacking trips. Her last backpacking trip was to the Trinity Alps, where we spent some wonderful days camped next to a large meadow surrounded by high peaks. The three of us went for short day hikes together as she was no longer up for longer adventures. The rest of the afternoon she spent rolling in the grass, drinking from the stream, and generally lounging in the sun and mountain air. When backpacking, we always supplemented her food with a taste of our meals and on that trip we shared our meals of frittata, pizza, and puppy s'mores (on short trips we eat well!). The Trinity Alps is also the range where she earned her nickname of "Wild Mountain Sula." On that early-season trip when she was young she didn't hesitate to walk up steep granite slopes above snow-covered lakes, and looked rather regal in the process. After she graced our lives for 12 wonderful years, we had to say goodbye this spring, which broke our hearts. Her passing was a big motivator for this journey and we decided to bring some of her ashes with us along the trail, to leave in mountain spots that had meaning to us and that she would enjoy. In the early afternoon on Day 56, we came across a stream running through a high meadow. There were pitcher plants growing along its banks and there was plenty of shade for a pup to curl up and enjoy a nap. Not far away was a campsite. The moment, we saw it, we knew it was the right place. Crying, we hugged and agreed that this would be her Trinity Alps spot. We hiked up the stream a little and found the perfect place to set her spirit free in these mountains. On the map it has no name, but in our hearts it will be Sula's Creek. We feel relieved and happier knowing that she is back in her mountains.